I’m super excited to be participating in my first One Room Challenge this week! It’s a home decor and DIY challenge for transforming a space in 6 weeks. Hundreds of bloggers participate by linking up weekly to share their progress and then finally the big reveal! I’ve heard that it can be stressful but the experience and results are completely worth it. The room that I’m making over is our rental kitchen. When we moved a little over a year ago, it looked like this. I’ve done some fun DIYs which you can see in the photo below but it could definitely use some more color and a “wow” factor. I can’t wait to get started! You can find all of the ORC links up HERE. If you are looking for some extra help in the decorating department, make sure to sign up for my FREE 5 day email decorating course! You can also find all my best renter friendly decorating ideas and DIYs for small spaces on the Rental Decorating Ideas page. Yay! So glad you’re joining in on the fun! I’m taking on my third ORC! You are going to love it!! Oh awesome!! I’ve been wanting to use the swiss cross pattern forever. Thanks so much for stopping by! This design looks great Kathy! You have an amazing eye for decor so I know this will be fantastic. So glad you decided to do it. 🙂 I already love the rug!!!! Thanks Steph! I hope I can find a similar rug out here. Nobody seems to ship rugs to FPO AP addresses. boo. Good luck! You always do such an amazing job sprucing up spaces in your home. Can’t wait to follow along! ooo love your wallpaper pick! good luck! Thanks so much Lianna. This is my first ORC, I’m just giddy with excitement. Love the rug and hope the washi tape on the image of your chairs is a clue about the color you’re going with for the new color in the kitchen. What a nice big space. I can’t wait to see what you do with the transformation. That floral wallpaper is SO stunning. I cannot wait to see the space for that alone! Yep, I’m in love with every last one of the choices you shared up there! It’s going to be so amazing!! I know you’re living in a rental, so it will be interesting to see how the space is transformed – that floral cabinet paper should be good! OH Kathy I can’t wait to see what you do with this room!! How exciting :). I know you’ll make it gorgeous! Hello, stopping by to say how I love the mood board, the colors and the decor you chosen for the OCR. Its going to be lovely, I can’t just tell. This is my first… Very excited. Also how did you stick those dishes on the refig, with out them falling, i’m thinking of using dishes above. I love your inspiration and that floral print. Looking forward to see what you come up with. Thanks Katy! I hope the floral print gets here in time. lol It’s the only thing I’m slightly stressed about (living overseas). 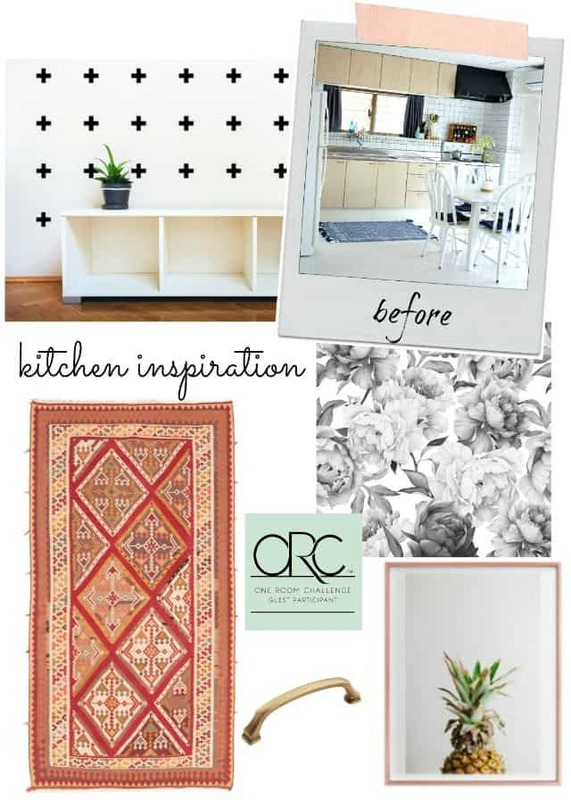 Great kitchen design board! I chose a similar wallpaper for my dining room. 🙂 Looking forward to see the space transformed over the next few weeks! Best of luck to you. Oh lovely! I really wanted to add a floral to the space. Thanks for stopping by! Kathy, this is my first ORC too. Can’t wait to see how your kitchen turns out. Love the idea of incorporating mint!